Ruched sleeves frame the bump-flattering fit of this minimalist maternity dress by Amanda Uprichard. Green crepe (100% Polyester). Shift. Three quarter sleeves. Boat neckline. 36" from shoulder to hemline. Imported. 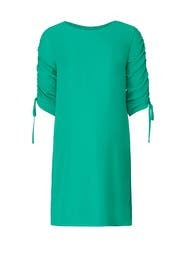 Great maternity dress for work or dressed up for event out. I was able to wear this during my third trimester in the spring. Light material and not form-fitting. I just wish it had a zipper or something to make it more accessible to put on. I'm petite so I'm finding that maternity clothes like this will probably only fit me in my last two months of pregnancy. It wasn't flattering around the waist. This dress can't possibly be maternity. Very unfortunate because it's a cute dress and was looking forward to wearing it. That is not possible.